Burroughs’ Sword and Planet science fantasy/fiction has influenced a long string of later writers have paid tribute to his Mars stories. "Hundreds of writers pastiched his [Burroughs] interplanetary romances with their own tales of swashbuckling Earthmen on alien worlds, but Burroughs' influence spread beyond this subgenre to cover the entire SF field. A few of the many writers who have directly or indirectly acknowledged his influence are Terry Bisson, Leigh Brackett, Ray Bradbury, Arthur C. Clarke, Robert A. Heinlein, James P. Hogan, Kim Robinson, John Norman and Michael Moorcock. In recent years the new millennium brings a revival of the Burroughsian interplanetary romance, reimagined for the 21st century in works like Al Sarrantonio's Haydn of Mars (2005), Chris Roberson's Paragaea (2006) and S.M. Stirling's The Sky People (2006). . . . A Princess of Mars is clearly a parent of the Star Wars movies, and just as clearly overdue for film adaptation." "I wish I had more control, more like Edgar Rice Burroughs had, but I'm a realist, too. I work in television. I don't know that I would want to spend the rest of my life controlling my characters." "It doesn't take long to establish that ERB published Tarzan of the Apes before Joyce published parts of Ulysses. So ERB couldn't have intended to connect the Wandering Tarmangani of Africa with the Wandering Jew of Dublin. I had played with the idea that ERB was splitting up the world of humanity with Joyce. ERB was showing us the Superman; Joyce, the Everyman. But I've failed to establish that either writer knew of the other, let along collaborated in secret or otherwise. certainly, if there is any derivation, Joyce would have derived from ERB, who is clearly prior in time of creation (and publication). However, it seems improbable to me that a writer with the cosmic scope of Joyce could have overlooked Tarzan. Surely, somewhere in the universe of Finnegans Wake, there is a reference, however ingeniously concealed beneath a multileveled pun, to a hero even greater than Finnegan. . . . I await the disclosure of the passage about the Immortal Ape-Man. And if the Joycean scholars won't take up the challenge, then I'll have to do the work myself. Our examination round his Tarzanification for ingumination of Work in Regress. . . ."
"How did a little girl growing up in England before World War II get involved with studying Chimpanzees," Goodall said. She described how she became involved with primatology. "I owe just about everything I've done right with my life and nothing I've done wrong in my life to my mother," Goodall said. Her mother supported her passion and curiosity for all living things. She introduced Goodall to the book "Tarzan" by Edgar Rice Burroughs when she was 11 years old. "Of course I was jealous when he married that wimpy other Jane," Goodall said. At 11 years old decided she would move to Africa and study the native animals of the undiscovered dark continent." "Star Wars is an obvious spin-off. In fact, the rumour is that George Lucas had originally contacted ERB, Inc. to film A Princess of Mars, Burroughs’ first book. And they couldn’t get together on it, so Lucas went off and wrote his own version of it and it became Star Wars." "Originally, I wanted to make a Flash Gordon movie, with all the trimmings, but I couldn't obtain all the rights. 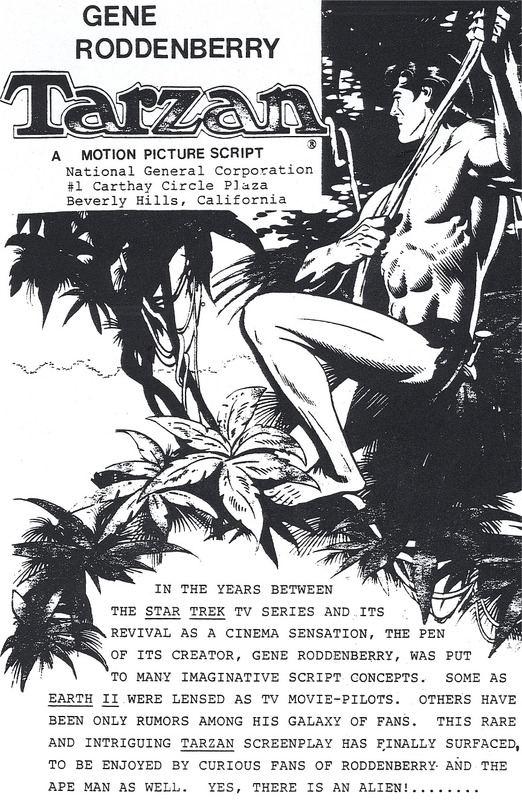 "So I began researching and found where (Flash Gordon creator) Alex Raymond got his idea: The works of Edgar Rice Burroughs, especially his John Carter series of books." "Young people today don't have a fantasy life anymore.... The films they see are movies of disasters, insecurity and realistic violence. They seem to be having a very boring childhood." "I think George Lucas was certainly inspired by that story for Star Wars," Conran added. "And I think [J.R.R.] Tolkein, to some extent, was inspired by that for Lord of the Rings. You can see the references in there. So there's a little bit of everything in the story. The ingredients and the world that Burroughs created is pretty rich." "He [Burroughs] sowed the seeds of science fiction and inspired the likes of Ray Bradbury, Star Trek creator Gene Roddenberry and Star Wars' George Lucas." "Alex Raymond, Francis Nowlan, Frank Paul and George Lucas were all influenced by the John Carter, Warlord of Mars series by Edgar Rice Burroughs (who would go on to write Tarzan). Burrough's very first novel was A Princess of Mars (1912), which was really the first swashbuckling, wish-fulfillment science fiction novel: . . . It's a shame this book isn't better-known, because if you can look past the silliness (which is no worse than any James Bond movie), Princess is one of the most exciting, imaginative and well-crafted adventure stories of all time, in the same league as Star Wars. The heroine, Dejah Thoris, is a strong female role-model even by today's standards, let alone for 1912 - she doesn't fight much, but she faces danger and makes sacrifices. And despite the silly James Bond-like male fantasy environment he lives in, hero John Carter is a faithful husband and caring father." "Edgar Rice Burroughs' early-20th-century John Carter of Mars fantasy novels, for example, included familiar-sounding names like Jeddaks, Banths, Tarkas and Woola while the space protagonists might wear a ray gun on one hip, a sword on the other. Luke's own adventures invoke not only the pulp thrillers of the 1930s and '40s but the juvenile sci-fi novels of Robert A. Heinlein and Andre Norton in the 1950s." "LOS ANGELES - Steven Spielberg, who will soon release the big-screen adaptation of H.G. Wells' "War of the Worlds," joined the famed author as an inductee into the Science Fiction Hall of Fame on Friday, May 6. Besides Wells, the 35 other previous inductees include Edgar Rice Burroughs, Ursula K. Le Guin, Andre Norton, Isaac Asimov, Ray Bradbury, Sir Arthur C. Clarke, Robert A. Heinlein, Michael Moorcock, Mary Shelley and Jules Verne." "In 1931, animation legend Robert Clampett approached Burroughs himself with the idea of making the book into ananimated film, to which Burroughs was enthusiastic. The author's son, John Coleman Burroughs, helped Clampett create an extensive array of sketches, sculptures and production notes while the rights to the project were picked up by MGM. However, Clampett and the two Burroughs soon clashed with the studio over the direction to take the film - the creators wanting to make a serious sci-fi drama, the studio wanting a slapstick comedy with a swashbuckling hero. Eventually, the studio pulled the plug on the entire project. Originally planned for a 1932 release, it would have been the first feature-length animated film (the honour of which is held by Disney's Snow White and the Seven Dwarfs (1937)). When Clampett toured and lectured at universities in the 1970s, he would often screen some of the uncompleted animation footage for enthusiastic audiences." "Lowell's concept of Mars became the basis for fantastic fiction by the likes of H.G. Wells and, later, Edgar Rice Burroughs. Yet, it was those lurid tales by Burroughs that inspired a youngster named Carl Sagan to spend his life investigating the possibilities of life on Mars — and elsewhere in space." "What most drew me to this [John Carter illustrated] project was the fact that the novel had such an impact on me in my youth. "Burroughs' storytelling is so rich with textures, that I wanted to expand on that, and yet stay as true to the core soul of the series as possible. Like H.G. Wells and Jules Verne, Burroughs truly was a genius far ahead of his time." [The first three novels of Edgar Rice Burroughs Mars series are] "a particularly fine instance of science fiction's attempt to cope with what Burroughs himself called 'the stern and unalterable cosmic laws,' the certainty that both individuals and whole races grow old and die." "The Superman character was created by Canadian artist Joe Shuster and American writer Jerry Siegel in 1932. Siegel later said that Superman was influenced by Tarzan and John Carter, two characters from the adventure novels of Edgar Rice Burroughs." Edgar Rice Burroughs (l875-l950) is known as the Grandfather of American Science Fiction. He predicted the invention of radar, sonar, television, teletype, the radio compass, the automatic pilot, homing devices on bombs and torpedoes, genetic cloning, living organ transplants, antigravity propulsion and many other concepts deemed totally fantastic in his time. His soaring imagination, coupled with the sure instinct of a master storyteller, assures him a position of honor among American writers of the twentieth century. For years he thought himself a failure . . . then he wrote a story. It sold and he wrote others and they too sold. Success no longer eluded him. His romantic fantasies were transformed into a world of vast adventure and excitement. He was imitated by many but none could equal him; none could match that special quality that set him apart. For each of those worlds he created was unique and fascinating and believable in its own right." The creations of Edgar Rice Burroughs continue to live on in the imagination of his readers in a way that few authors ever achieved. No matter where you go in this world, everyone knows of Tarzan. The imagination of Edgar Rice Burroughs is with us today and endures. Edgar Rice Burroughs...could pace, he was accessable, he was a brilliant inventor of languages, and he told emotionally satisfying morality plays in an action/adventure framework. He had the capacity to imagine fully-fleshed worlds by the carload. ...no one since then ...has created a greater number of wildly popular imaginative series. Yes, he was followed by many better, more subtle, more erudite writers ...most of whom built upon his foundation...but...he was the first, and he is still very readable and very popular, and what more need you ask of a pioneer? Edgar Rice Burroughs was to become the acknowledged master of the scientific romance. In stories of this nature, colourful adventure in the classical sense is seasoned with just enough science to lend wonder and enchantment to the background and locale. ...The rousing enthusiasm that greeted his first novel, A Princess of Mars, was to usher in a golden era of escape science fiction. Burroughs completely divorced the reader from association with reality and carried him off to a never-never world of his own creating. ...He was a natural storyteller. His style never jarred. It flowed along, quickly and smoothly, weaving the reader into the spell of the story. ...Literary critics, judging ERB by absolute literary standards, have never been kind. They have pointed out that his plots are repetitious, his prose construction often hasty, with an overwhelming emphasis on action and violence and the fact that some of his novels seemed to be a pointless procession of incidents rather than a completely co-ordinated whole. Burroughs never denied the charges and with almost a note of apology frequently explained that it was his purpose to write for those who desired entertainment and escape and that he expected his works to be judged by that standard. ...In all the literature of mankind, only Sherlock Holmes is nearly as well known as Tarzan. This popularity is justified. Tarzan of the Apes is a great and fabulous adventure epic. ...it seems likely that at least Tarzan will be printed and read long after many authors "with pointed messages for our times" have been forgotten. The novels of Edgar Rice Burroughs have acted as dream catalysts, spanning the planet with an uncountable number of mind dramas. ...We have shared the dreams he invoked. In a very real sense the spirit of that great Magician of Dreams pervades these pages. His magic took hold of (our) minds...it has reached across the decades to draw us together.... We are fellow wayfarers. Sometimes, of course, the magic fails; and so we have critics who look on in amazement at the phenomenon that is ERB. The dreams have gone unrecognized, perhaps hidden behind failing of language and character and plot -- dingy gold, cast aside for brass. The loss, of course, is theirs. All man's works are flawed, if one looks closely enough, and there is little to be gained -- much to be lost -- by judging a work on its failing rather than its successes. Magic is fragile and does not bear close scrutiny. Edgar Rice Burroughs is beyond doubt one of the most widely-read and enjoyed authors in 20th century literature. An unassuming American writer, his tales have been translated into thirty or more languages.... Burroughs' works have become literary classics. Formal recognition of this fact came in 1962 when a study-edition of his first story, A Princess of Mars, was published for British school use, as one volume in a series comprising such native authors as Conan Doyle, Sir Walter Scott, Robert Louis Stevenson, and Shakespeare. and the publisher who ranked ERB as the only American among this distinguished company was none other that the venerable Oxford University Press. ... "He being dead yet speaketh." And we shall not soon see his like again. Mr. Burroughs convinced me that I could talk with the animals, even if they didn't answer back, and that late nights when I was asleep my soul slipped from my body, slung itself out the window, and frolicked across town never touching the lawns, always hanging from trees where, even later in those nights, I taught myself alphabets and soon learned French and English and danced with the apes when the moon rose. But then again, his greatest gift was teaching me to look at Mars and ask to be taken home. I went home to Mars often when I was eleven and twelve and every year since, and the astronauts with me, as far as the Moon to start, but Mars by the end of the century for sure.... We have commuted because of Mr. Burroughs. Because of him we have printed the Moon. Because of him and men like him, one day in the next five centuries, we will commute forever, we will go away...And never come back....And so live forever. "It's [the Star Wars series] the Wizard of Oz in outer space," he said. “There's a lot of L. Frank Baum in there. A lot of Ed Rice Burroughs. It's good, primitive fun. It's the serials we loved when we were kids." When Edgar Rice Burroughs wrote "Dejah Thoris, A Princess of Mars" in 1911, he had no idea that he was opening a new era in the science fiction field. Over a period of thirty years, Burroughs wrote ten Martian tales...the story of life and death, romance and tragedy on the Red Planet is undoubtedly one of the greatest series of all time. Burroughs created a world of dead sea beds, towering mountains, polar ice caps, underground rivers... he peopled the planet with four different human races and one semi-human. He gave Mars a history, several phases of civilization and an assortment of religions. He added dauntless heroes, beautiful maidens, evil villains and fearful monsters -- all the ingredients necessary for a series of thrilling adventures on any world! I can remember as a child reading with breathless fascination the Mars novels of Edgar Rice Burroughs. I journeyed with John Carter, gentleman adventurer from Virginia, to "Barsoom," as Mars was known to its inhabitants. I followed herds of eight legged beasts of burden, the thoats. I won the hand of the lovely Dejah Thoris, Princess of Helium. I befriended a four-metre-high green fighting man named Tars Tarkas. I wandered within the spired cities and domed pumping stations of Barsoom, and along the verdant banks of the Nilosyrtis and Nepenthes canals. Might it really be possible - in fact and not in fancy - to venture with John Carter to the Kingdom of Helium on the planet Mars? Could we venture out on a summer evening, our way illuminated by the two hurtling moons of Barsoom, for a journey of high scientific adventure? ... I can remember spending many an hour in my boyhood, arms resolutely outstretched in an empty field, imploring what I believed to be Mars to transport me there. Edgar Rice Burroughs' stories about Tarzan, John Carter and David Innes were great. His characters are true classics...everything I read in comics and books made me want a life of adventure. In that respect, (they were) a motivating factor -- a strong one at that. And I can say (that such) characters helped me be honest and morally strong. They were good examples to emulate when you are growing up. The people who write science-fiction stories are dreamers. They create the ideas from which scientists begin their search. Just think what this country would be like if we did not have writers who dream of making things better.... Without the dreamers, our country could be in pretty bad shape. Science fiction is the material from which dreams begin their initial journey to reality. Without that first building block, we, as a nation, cannot advance and we would eventually stagnate. A stagnating civilization will eventually collapse in on itself. I would have never gone into space had it not been for someone in the past who one day wondered if space travel was possible -- that person dreamed the dream and I was very fortunate to be able to fulfill his dream from long ago. * In the video game Jurassic Park: Trespasser there is a statue of E. R. Burroughs, possibly as a reference to his novel The Land That Time Forgot. * In Rainbow Mars by Larry Niven, several different fictional Martian races appear, including a people who are a combination of the Red Martians of Edgar Rice Burroughs and those by Ray Bradbury, and another who are unmistakably Burroughs' big fierce Green Martians. * In the Mars Trilogy novels of Kim Stanley Robinson the original capital city on Mars is named Burroughs as a sort of tribute. It is later flooded. * Season 1, Episode 29 of Disney's The Legend of Tarzan animated series, Tarzan and the Mysterious Visitor, illustrates Burroughs as a struggling writer who travels to Africa in search of inspiration for a new novel (actually, Burroughs never set foot in Africa). In the cartoon he is called "Ed." * The 1980 novel The Number of the Beast, by Robert A. Heinlein featured characters named Zebediah John Carter, Jacob Burroughs, and Dejah Thoris Burroughs in homage to Burroughs' Mars novels. Among other things, these and the other main characters travel to various alternate universes, including Barsoom, Oz and Wonderland. The protagonist of Heinlein's Glory Road muses on Barsoom in one passage. * The Marvel Comics book Excalibur created by Chris Claremont and Alan Davis paid a tribute to the John Carter stories in issue #16 and 17. The story was billed on the cover of issue #16 as "Kurt Wagner Warlord of ?". The series added a further tribute with issue #60 and the story "Braddock of the jungle". * In The Alternate Martians (Ace, 1965) A. Bertram Chandler explored a fictional Mars curiously combining characters, including Deliah (for Dejah) Thoris and Tars Tarkas, and characteristics of Burroughs's Barsoom with the malevolent Martians of The War of the Worlds by H. G. Wells. * In Frank Frazetta's Creatures published by the Frazetta Comics imprint at Image Burroughs appears as a member of a group of supernatural investigators led by former US president Theodore Roosevelt. * In Rocky II, Rocky reads "The Deputy Sheriff of Comanche County" to Adrian while she is in a coma. * In the TV series ER, the character played by Noah Wyle is usually called simply Carter, but his full name is John Carter. The creator of ER, Michael Crichton, has cited the work of Edgar Rice Burroughs as an early influence, thus this homage. * In Alan Moore's The League of Extraordinary Gentlemen, John Carter appears twice. He teams up with H. Rider Haggard's Allan Quartermain, H. P. Lovecraft's Randolph Carter, and Wells' Time Traveller on a strange journey in the supplemental Allan and the Sundered Veil. Later, he is seen leading the Green Martians in a battle against Wells' Martian invaders. I have tasted fame-- it is nothing. I find my greatest happiness in being alone with my violin. In one respect at least the Martians are a happy people; they have no lawyers.